Teachers: Visit Teaching with Photographs for questions to ask your students about industrialization. Larus & Brother Tobacco Company, Richmond, c. 1911 (VHS accession number: 2001.230.562). Photograph, Larus & Brother Tobacco Company, Packing Plug. Image shows the packing of Edgeworth Plug Slice by hand. Image dated 1911. Launching of the "Herndon", Newport News, 1919 (VHS accession number: 2006.100.10). Photographic print, Launching of the "Herndon", Newport News, Va., May 31, 1919. Also printed on the reverse: "In the Historic James River". Black and white photograph shows a ship, the Herndon, as it is backed out of dry dock into the James River. A crowd of people watch the launch from a platform in front of the Herndon and from the deck of another ship to the left. The platform and ships are decorated with American flag bunting. 18.42 cm x 24.77 cm. Cotton bales, Norfolk (VHS accession number: 2008.1.55). 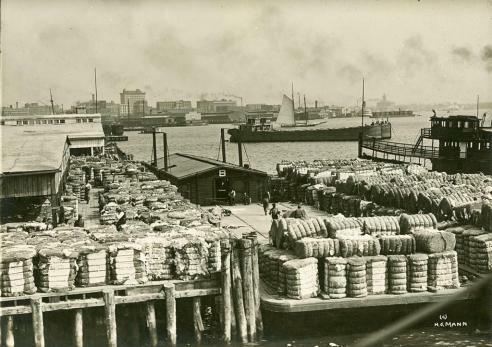 Black and white photographic print of cotton bales ready for foreign shipment in Norfolk, Virginia. Shows a harbor scene with docks and boats. 12.70 cm x 17.15 cm. 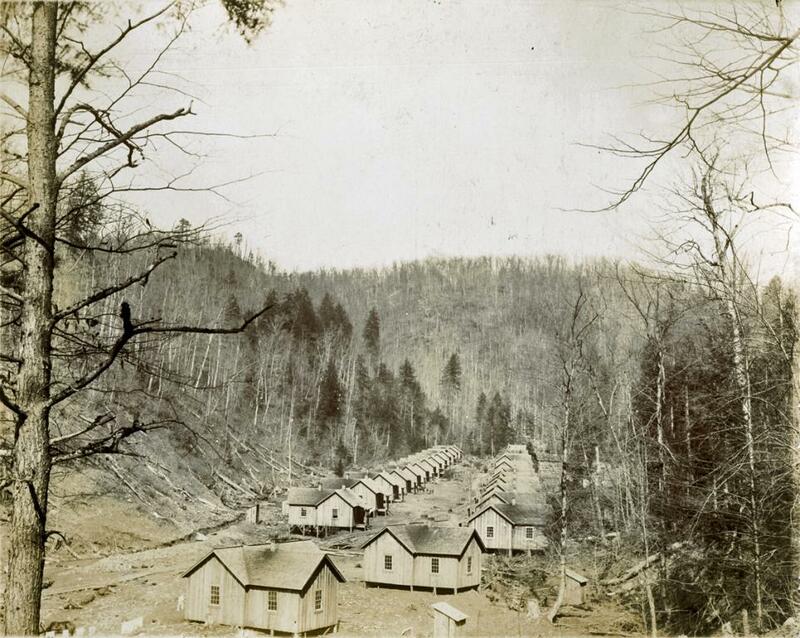 Turkeyfoot mines, Big Stone Gap, c. 1906 (VHS accession number: 2001.528.4). A black and white postcard of the entrance to Turkeyfoot mines in Big Stone Gap, Virginia. In the background is the entrance to the mine and there are track for the horsedrawn carts to be pulled on. Most of the trees are barren. There are four cars on the rails. There is writing on the obverse and reverse and a postal cancellation dated May 15, 1907 and a green one cent stamp with an image of Benjamin Franklin on it. Larus & Brother Tobacco Company, Richmond, c. 1911 (VHS accession number: 2001.230.560). 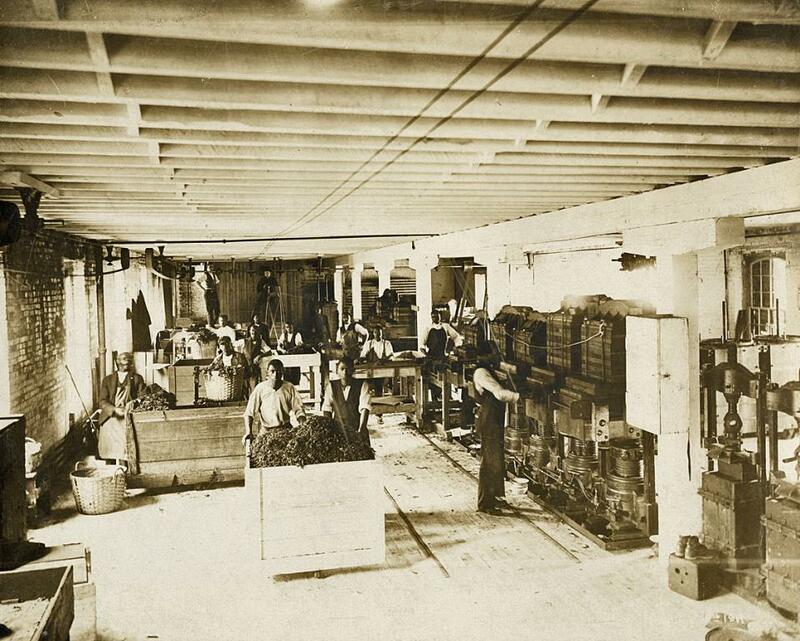 Photograph, Larus & Brother Tobacco Company, Tobacco Pressing. Image shows process of tobacco pressing. Mining at Tom's Creek, Wise County (VHS accession number: 2000.186.343). Collection of black and white photographs of mining at Tom's Creek, Wise Co., Virginia.